​is to build a collaborative learning environment and culture that emphasizes - Responsibility, Innovation, Complex Thinking, Effective Communication and Excellence. We, as Seariders of Wai’anae High School envision a 21st Century community of learners empowered to succeed in a global society. It is gratifying to be back at Wai'anae High after an absence of almost 20 years. Wai'anae is a special place-- I know this, I've lived here my whole life and live in Makaha still. I've seen many changes, but some things stay the same: Wai'anae pride is important, no one can get us down, we care about family, we take care of others. There are many wonderful things happening at Wai'anae High and we know there is always room for improvement, also. We are all part of the solution if we work together to set goals, help each other, and never give up. Ho'omau! Persevere: go over, under, around or through. Never give up! Waianae High School is located on the Leeward Coast of Oahu, 35 miles from Honolulu. Waianae High School students come from the rural communities of Maili, Waianae and Makaha. The Nanakuli and Waianae Complexes (which include Waianae High School and our feeder schools) are targeted to be part of the Zone of School Innovation (ZSI) under Hawaii's Race-To-The-Top (RTTT) educational reform model. Schools in the ZSI will be required to implement Hawaii's RTTT initiatives. Waianae High School is in the process of redesigning our academy structure to meet the 21st century needs of our students, and is working towards providing more personalized education, more rigor and relevance in our classrooms, increasing parent communication and involvement, and fostering and supporting a professional learning community for teachers and staff. To support this vision, Waianae High School's academy structure promotes a smaller learning community (SLC) philosophy beginning with our Ninth Grade Success Academy (NGSA) for all incoming 9th grade students. The SLC support structure continues into 10th grade as students move into either our Sophomore Academy or into the Searider Productions Academy – a New Tech Network School. Two career academies service WHS's upper grade students. Upper grade career academies are organized into the following areas of student interest: Natural Resources/Arts & Communication (NR/AC), and the Business, Industrial, Engineering and Technology/Health and Human Services (BIET/HHS) academies. Waianae High School uses a 4x4 block schedule to accommodate student needs and interests. The 4x4 block also provides students with opportunities to participate in Running Start and early admission courses as college credit options. Waianae High School was accredited by the Western Association of Schools and Colleges for a period of three years with a mid-term review. This school's accreditation term expires in 2014. 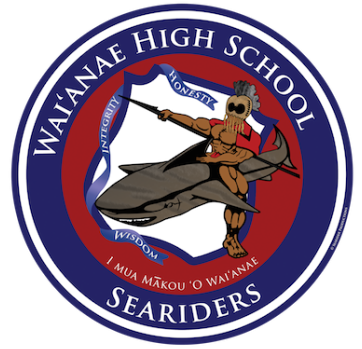 The Searider is the official mascot of Wai`anae High School. A warrior of the ahupua`a, he is tasked with protecting the coastline. "I mua mākou `O Wai`anae" translates to we of Wai`anae move forward.